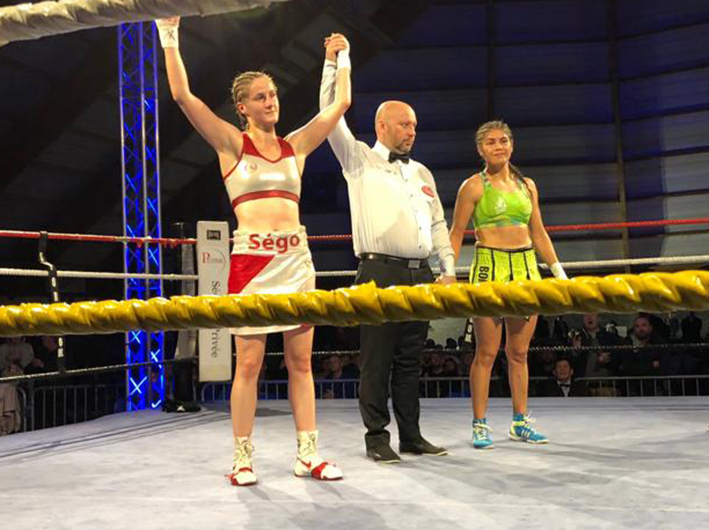 Local stars Segolene Lefebvre and Mehdi Mouhib were excellent on Friday night, November 2, when they both triumphed in World Boxing Federation (WBF) Championship fights at the Complexe Sportif Gayant in Douai, France. Lefebvre secured the best win of her career, as she retained the WBF Womens World Super Bantamweight title for the third time, by scoring a wide unanimous decision over former WBA and WBO World Champion Yesica Patricia Marcos from Argentina. The defending champion was very effective in using her reach and swift footwork, boxing from the outside and landing precise jabs and counter-punches, while Marcos struggled to get through with much of consequence except for some good body-shots. After ten rounds of boxing, judges Christophe Hembert, Smail Alitouche and Alexander Plumans all scored the fight 98-92 for 25-year-old Lefebvre, who improved her professional record to 11-0 (1). Marcos (32) goes to 28-2-2 (9). Mehdi Mouhib had an unexpected easy time winning the vacant WBF Intercontinental Welterweight title, when he dispatched of previously undefeated Egyptian national champion Abdumonem Said already in the second round. Said went down from a hook to the liver and a right cross to the chin at the end of round one, but managed to beat the count of referee Christophe Hembert. However, it was only a matter of time as Mouhib stalked him in round two and put him down again with a right had, prompting the Egyptian corner to throw in the towel. Mouhib showed great promise in what was his first big test and title fight, taking his unblemished record to 17-0 (11). Said, who tried his best but was simply outclassed and out-gunned, travels back to Cairo with his first defeat, dropping to 18-1-1 (8). Ji Hyun Park Continues Quest For Fourth World Title. Go to Homepage. © 2019 The Pugilist. All Rights Reserved.